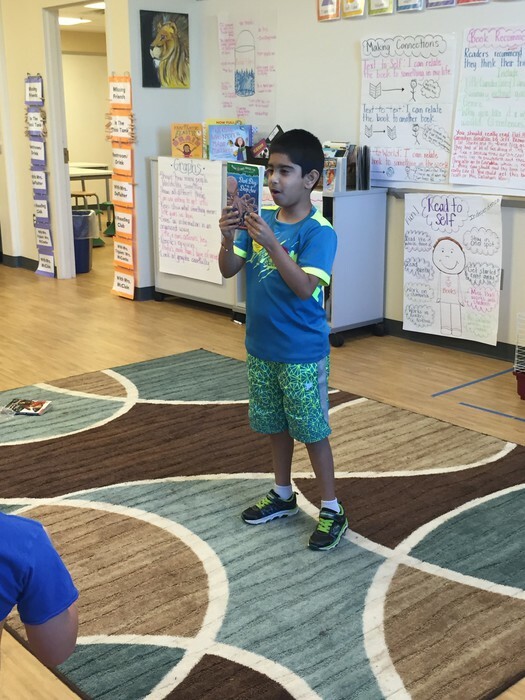 Reading- We focused on making connections with the book we read and identifying the story elements. Students should be able to identify characters, setting, problem and solution in a fiction story. Math- This week we started discussing addition with regrouping. One thing we are really focusing on this year is proving our answers. We want to be sure students understand why they need to regroup and aren't just completing a process. Writing- We continued making lists this week, and made a list of memories that will later become a personal narrative topic. We are loving the organization of our Writer's Notebooks so that students can use them effectively throughout the year. Next week we will begin mini-lessons to focus on specific writing skills. 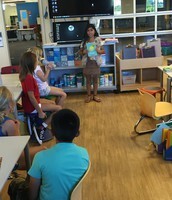 Genius Hour- Genius hour did not happen this week because we were in an all-day training and had substitutes. We will pick up next week. We will have a variety of education websites students can use to practice skills in math and reading. You've probably heard them talk about these, and we know they've been anxious to get started. Aleks: I know many of you have been anxious to get started with Aleks. We will be taking the pretest next week and students will have their login information after October 3rd. Mrs. Callahan and I want to wait until we are trained in Aleks to let students begin using this resource. Aleks will not be a required resource to use as it is in some grades, but all students will have access. MobyMax: This is an awesome resource for math and reading. Students can earn game time as they work through lessons. 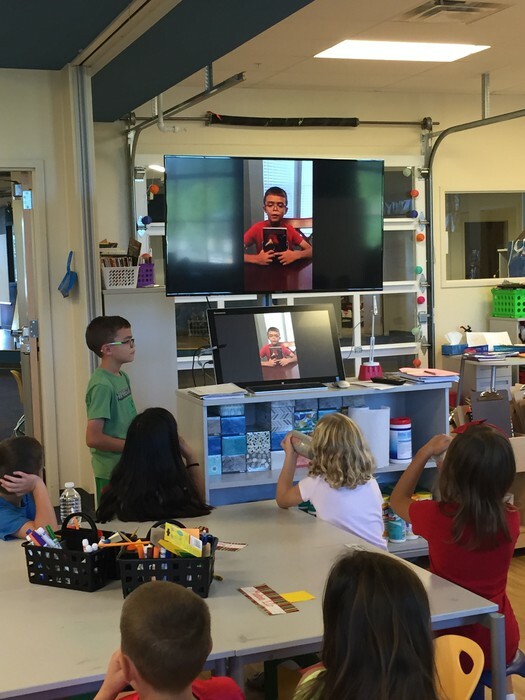 All lessons are tailored to meet your child's individual needs based on a pretest they took. 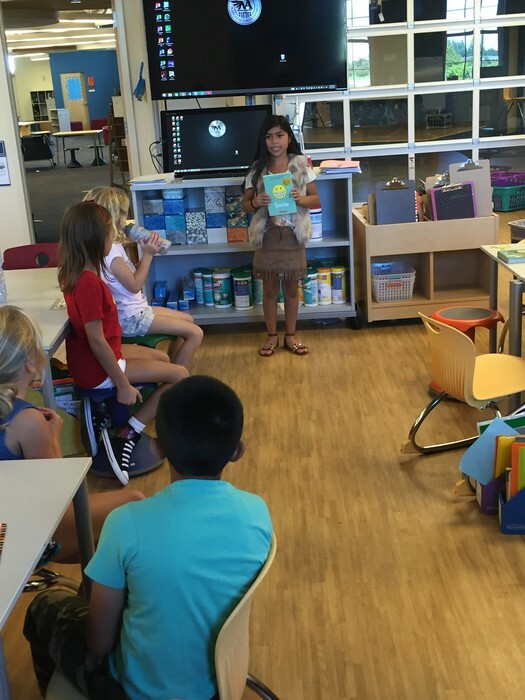 Students earn classroom money when they earn a badge. To log in: Students' usernames will be the same as their google account. For example, mine is pratt.3. The password for all students is eagles3! How do I have my child show their thinking?! We have had several parents ask how they can support their child in showing their thinking. The #1 way your child can show his/her thinking is through pictures. For addition and subtraction we draw place value blocks often. For rounding, students can draw a number line. For multiplication and division students can draw a picture showing groups for a number (ex: 4x8 they can draw 4 groups of 8). 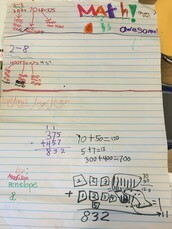 As you can see from the picture on the left, this group showed 3 different ways that they solved this addition problem. They used pictures, expanded form, and the traditional algorithm. Think of the saying: "A picture is worth a thousand words." 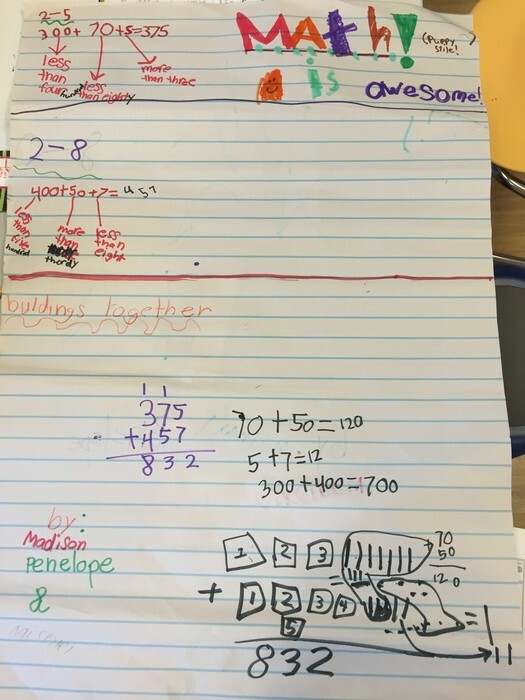 Visuals are a powerful way for students to show their thinking. 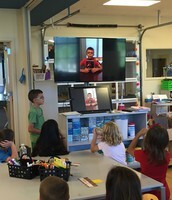 Alex created a video to give his book talk on Tuesday. Rhianna gave her book talk on a book titled Smile. 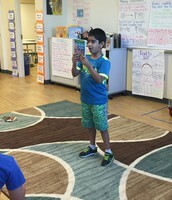 Samarpreet gave his book talk on an I Survived book, which goes along with the read aloud we are reading in class.